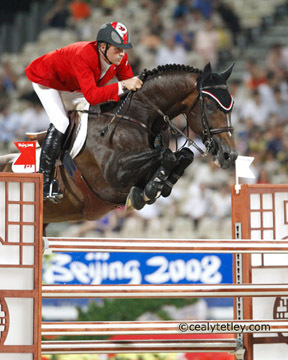 The news of Hickstead's death at the Verona CSI in Italy today spread quickly among the online equine community. Even if you didn't watch the video of his last moments, we all realized how sudden it is. I don't know about anyone else, but it reminded me of the mortality of our horses. They make us feel incredible, invincible - a horse can humble or inspire you (and sometimes those two are one in the same). They are the symbol and vehicle of freedom of many, the best friends of many an awkward (and not awkward!) teenage girl, an instrument of livelihoods and leisure times. Treat a horse right and they will have your back, save your life (physically and emotionally), teach you as many lessons as you can open your heart to learn. And as quickly as they come to you, as immediate as the epiphanies they provide you can be - they can go, again. Disappear before your very eyes and leave you gutted - a stronger and better person for having known and loved them - but devastated for that loss. I had eight hours to come to the realization that Angel was going, that I would have to wake up the next morning and begin to move through my life without her. I cannot even begin to imagine the way it felt when that realization came to Eric, when his steed staggered out from under him after a brilliant round and then died before his eyes. I can imagine the hole in his heart - I know, I have been there. So tonight, as I put my arms around my frustrating, quirky, portly pony, I thought of Hickstead, of his team, and the man with whom he flew. I put my hand on her chest and wondered 'will you ever leave me this way? ', my hand on her stomach and asked the same thing. And then I realized - it doesn't matter. Someday, every horse will leave every girl who ever loved them. Behind them, they will leave a legacy - it might not be in the media, as widely televised as the incredible performances of Hickstead - it could just be in the heart of a girl who will never forget them. I think Hickstead will do a little of both. Godspeed, big little horse.